Currently, total health expenditures in the US make up around 17% of GDP. The average for the OECD is 9.3%. Around half of our healthcare spending is public while the other half is private. Thus, very roughly speaking, to shift all of the current healthcare expenditures onto the public health insurance, you’d need initially to raise the tax level by 8.5 points of GDP (half of 17%). If you believe, as I do, that switching to a single-payer healthcare system would allow us to better curb healthcare inflation and thus to control costs much more effectively than we currently do, then that means that the 17% of GDP we currently pay towards healthcare could be pushed down over time. Let’s assume that, by keeping healthcare inflation in check through single-payer, we could eventually bring health expenditures down to around 10% of GDP (slightly above the OECD average). Under this scenario, we would initially raise the tax level by 8.5 points in order to cover the half of health expenditures that are currently paid out privately. Then, over time, we would cut healthcare expenditures by 7 points (from 17% to 10% of GDP). Assuming we didn’t lower the tax level over the expenditure-slimming period, we would be able to use those 7 points of savings towards other welfare programs (child care, child allowance, paid leave, etc.). And there is a lot of stuff you can get with 7 points of GDP. Single-payer healthcare is the only program that would allow you to pull of this kind of trick. This is because it is the only program that, if done right, will require progressively less revenue (as a percent of GDP) to operate over time. If you can win the initial tax level bump necessary to make it happen (which you can sell as being a simple cost shift from private premiums to public taxes) and hold on to the tax level bump as healthcare expenditures recede, then you can fill out much of the welfare the US currently lacks with the resulting surplus. One of the things I am not looking forward to in the coming elections are people who become sudden experts on the Nordic Model and the social democratic history of the Nordic countries. Partisans of various stripes, uninterested in understanding how the Nordic countries actually developed, will mobilize their considerable googling skills to conclude whatever they want about the election. Dmitri Melhorn’s piece in the Daily Beast, which argues that Clinton is the actually candidate of Danish politics, is at the leading edge of the coming onslaught. To be sure, both Clinton ’92 and Sanders ’16 sought to improve America’s safety net. Unlike Sanders, however, Bill Clinton recognized the policy work required to afford such social goods. The first part of this hard work is fiscal discipline. For decades, according to World Bank figures, Denmark has maintained a sound budget. Aside from the Clinton Administration’s record from 1992 through 2000, the United States has been much weaker in this area. During those years of fiscal probity, balanced-budget advocacy group The Concord Coalition published an annual scorecard of the “Deficit Hawks” in Congress. Then-Congressman Bernie Sanders did not make the list. On the contrary, in both the House and Senate, Sanders has supported spending such as agribusiness subsidies, while opposing fiscal reforms such as earmark bans and balanced budget amendments. As an initial matter, it’s important to note that Bill Clinton did not seek to improve America’s safety net in 1992. Rather he sought to weaken it, which he accomplished by gutting AFDC and precipitating a 150% increase in the extreme poverty rate. But we can put that aside here and address the fiscal discipline point. As far as fiscal discipline goes, here is government spending and government revenue for Denmark and the US between 1996 and 2013. If by “fiscal discipline,” one means that Denmark’s government spending and government revenue levels are similar, that’s definitely true. 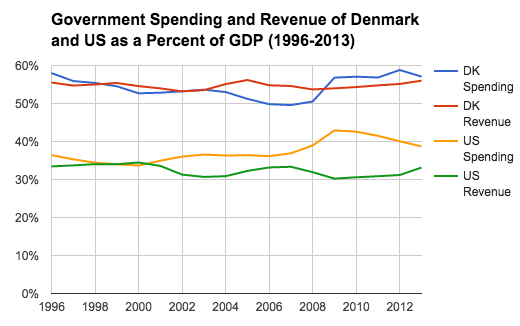 But Denmark gets there not by keeping spending low, but by keeping government revenue high. In 2013, DK’s government revenue was 22.9% percentage points of GDP higher than the US. In terms of US GDP, that’s the equivalent of $3.8 trillion of additional government revenue in 2013. If the US wants to be more like Denmark, it will achieve that by taxing way more and spending way more, not by trimming earmarks, which are budgetary rounding errors. Denmark does not balance its budget every year. Notice how sometimes the blue line is higher than the red line, especially after the Great Recession. This is because sometimes it doesn’t make sense to balance a budget, and creating a constitutional amendment to require it may be the dumbest fiscal idea circulating in the world right now. Immediately after the Democratic debate, the Danish Ambassador to the United States told Time Magazine that: “Denmark has a lot to offer in terms of how we organize our society,” he said. “Danes have a very flexible labor market and we are open for business.” On this, the Clintons have been consistently right, and Sanders has been a consistent foe. The labor market in Denmark (and the other Nordic countries) is a constant source of confusion among the instant Nordic Model experts. It is so unlike the US that people have a hard time even beginning to understand it. Nordic countries have heavily organized labor markets. In 2012, two-thirds of Danish workers belonged to a union, and many non-union members are covered by sector-wide union contracts. It is national labor agreements, rather than government statutes, that establishes much of what we would call “labor market regulation.” For those who only think the government is capable of “regulating,” this alternative way of doing things is often described as featuring a very deregulated labor market. For instance, you’ll often hear people say Denmark has no minimum wage, even though national service sector labor agreements make it such that McDonald’s workers in Denmark pull down $20 per hour. Melhorn is right that Denmark has a flexible labor market, i.e. 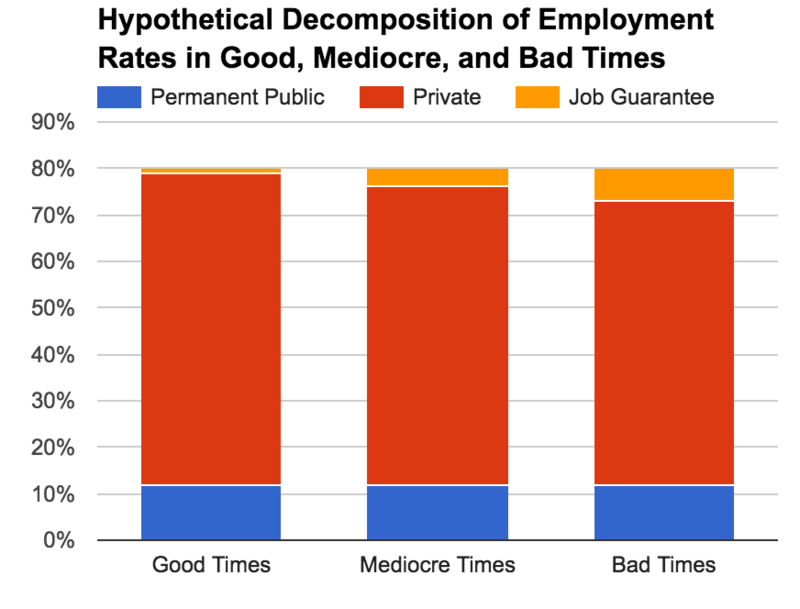 a labor market where turning over and reallocating labor to new jobs is not difficult or discouraged. But the way it achieves that is through massive government welfare expenditure. In 2011, Denmark spent 2.2% of its GDP on public unemployment benefits and another 2.2% of GDP on active labor market policies (public employment services, retraining, and employment subsidies aimed to help the unemployed get jobs). By comparison, the US only spent 0.8% on unemployment benefits and 0.1% on active labor market policies (ALMP). So in the most recent US GDP terms, Denmark is spending around $390 billion per year on unemployment benefits and another $390 billion on ALMP. For comparison sake, the yearly ALMP expenditure alone is more than 10x the amount of money Clinton is proposing to spend on creating debt-free college. In Denmark’s propaganda (not that I doubt it), they describe this “flexicurity” approach as promising employment security rather than job security. Every worker knows that, should they need to be laid off, they will receive very generous unemployment benefits and very generous assistance in making their way to a new job. America does not promise this. And to say Clinton has been “right” on this and more in line with Denmark on this, like Melhorn claims, is paint-huffing levels of idiocy.